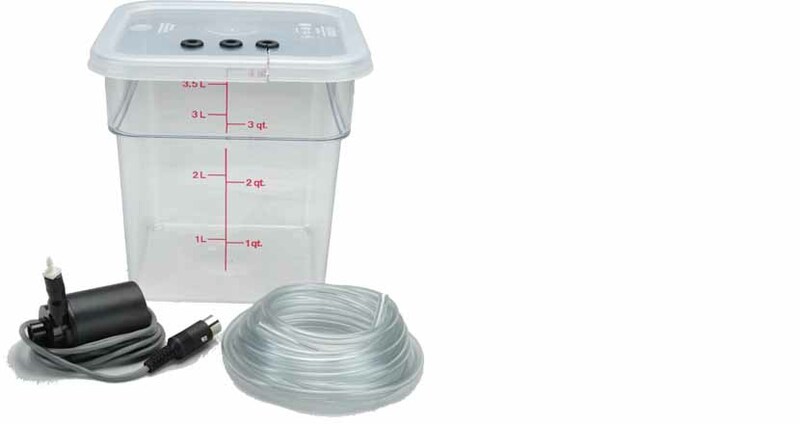 The Bath 10 consists of a 12-Volt DC submersible pump, a bucket and a coil of 1/8-inch ID vinyl tubing. The pump has an electrical cord and connector for plugging into the back of a TC 1 Temperature Controller, and a fitting on the outlet to accommodate the tubing. The bucket has a tight-fitting lid with three holes. The holes have grommets to hold the inlet tube, outlet tube and electrical cord. The hole for the electrical cord is split to permit passage of the cord. The Bath 10 is our least expensive means of providing circulating fluid to Peltier heat exchanger. We recommend the use of an algicide to prevent the growth of numerous species of flora and fauna that will otherwise quickly overtake the standing water. (We do not provide algicide due to the expense of shipping chemicals.) Also, if the pump runs dry, it may not prime itself well. A small drop of detergent in the inlet usually solves this problem.